Having removed the spare bike off the roof I needed to turn around and head of out of Lincoln and up through the Glory Hole and the Brayford Pool. I am sure I heard some cheering as I left Lincoln. British Waterways has now begun essential engineering works in Lincoln city centre to ensure that a 200 year old lock on the River Witham can continue to be enjoyed by the thousands of people that visit every year. 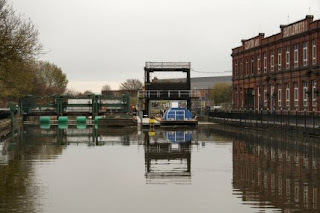 Stamp End Lock will undergo replacement of its oak bottom gates between 9 and 20 November, as part of British Waterways’ annual stoppage programme. 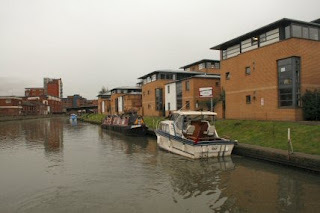 Stamp End is a busy lock in the heart of the city centre, with hundreds of boaters passing through every year. The structure is unique in the East Midlands, as it has the only guillotine gates in the area, so-called because the gates are hydraulically opened by lifting them vertically up like the action of a guillotine. The lock, which is half a mile from Lincoln’s castle and cathedral, was originally built with more traditional oak gates and balance beams at either end in late 18th century. It was rebuilt in 1826 when it was used as a toll collection point and the unusual guillotine style top gate was installed in 1950. Once into the Brayford I noticed nb Gypsy moored in a rather odd position. No one onboard so I carried on to the 'facilities'. As I pulled along side Julian from Gypsy asked if I could lend a hand. 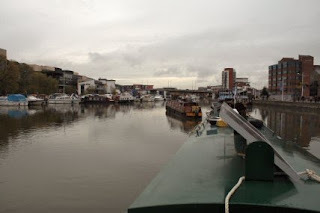 It seems that as he was going through the Brayford the boat just stopped moving forward and drifted on to the end of the moorings and all the tupperware boats. It could have been an awful lot worse. 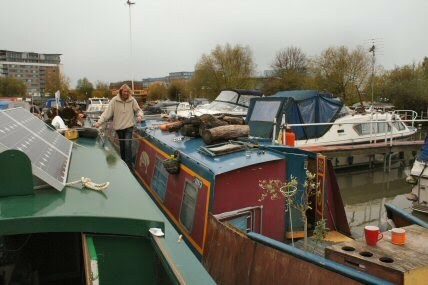 We travelled back to the Brayford and tied the two boats together and then moved them out to the middle of the Pool. At this point Gypsy was left to drift for a moment while I went astern and changed sides so that taking them to the mooring would be easier. It didnt take very long and the boat was back (almost) at its home mooring. The owner of Ursa Minor had decided to dump their boat illegally and use someone elses mooring. It really is nice to be able to put just a little something back after all the acts of kindness I have received from boaters over the past year. Used the facilities and travelled gently along to moor up at The Woodcocks for the evening. Still a lot of water in the canal with lots of weed quickly floating past.